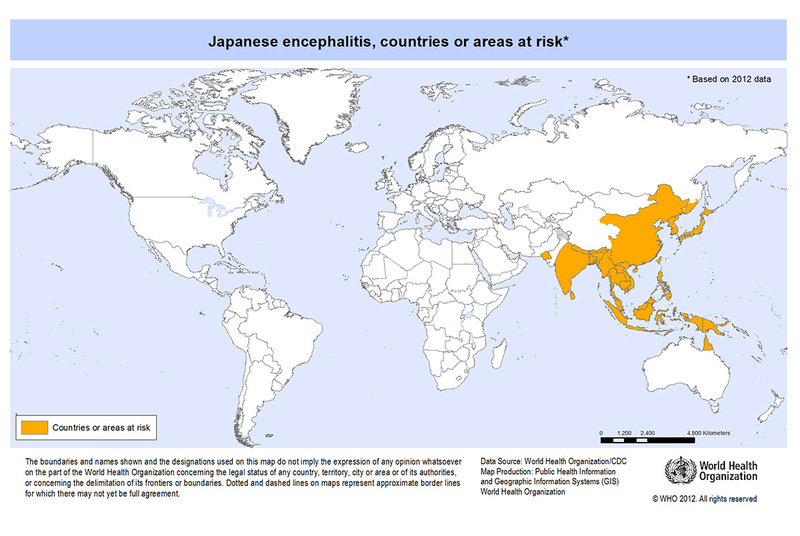 Japanese Encephalitis is a viral brain infection which is spread via mosquito bites. The disease causes inflammation of the brain which can result in permanent brain damage and death. Countries at risk Japanese Encephalitis is predominantly found in India and South East Asia and a very remote part of North East Australia. Japanese Encephalitis is transmitted by mosquito bites. The mosquitos that carry Japanese Encephalitis breed off birds and pigs and are therefore more commonly found near rice fields and agricultural farms. It is important to always be protected with a DEET based insect repellent to give extra precaution against mosquito based diseases. Most people infected with this disease have no symptoms or very mild flu like symptoms. In certain cases (1 in 250 people) the infection can spread to the brain leading to seizures, confusion and paralysis. There is no cure for Japanese Encephalitis and treatments involves helping the body fight off the infection by giving the infection person fluids and oxygen. The Japanese Encephalitis vaccination consists of two doses given a month apart and should be considered for travellers planning outdoor activities or planning on living near farms or ricefields. The vaccination lasts for two years.